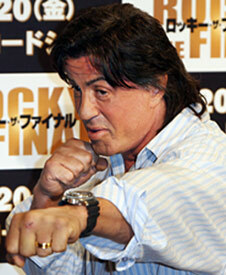 Sylvester Stallone has all kinds of characters to revive at your local movie theater. After Rocky Balboa's $70 million box office take last year, and the current Rambo's not-too-paltry $40 million haul, Stallone is in negotiations to bring another tradermark character back to the big screen: Gabe Walker. Wait, who? That's right, the guy from 1993's Cliffhanger...and while that popcorn flick was a pleasant enough diversion (gotta love John Lithgow's hilariously over-the-top baddie), we're not sure movie buffs are eagerly anticipating a reprisal. It could be time for Sly to try some new tricks (or at least wait a bit longer before resurrecting his rock climber, arm wrestling and soccer playing personas. Remember Victory with Pele?) According to PR Insider, this new potential Sony project will be called simply The Dam (although not to be confused with Stallone's 1996 trapped-in-a-tunnel actioner Daylight). Sly Stallone. Bring me a mountain.